The first Trine was one of those gems that not enough people played, either because they didn’t think it was for them or the fact that they missed its existence altogether, developer Frozenbyte is hoping that that doesn’t happen the second time and have pull out all the stops in order to create Trine 2 and make it the best game that they possibly can make it. The screenshots that we were treated to before the game came out made everything look fantastic, piquing the interested of everybody that even had a small amount of interest in the title, turning them in slobbering zombies of their former self, hoping and praying that the screenshots were looking at were truly representative of the final version. If they were, we were going to be treated to something truly special, combining those visuals with the world and gameplay of Trine that we all loved. 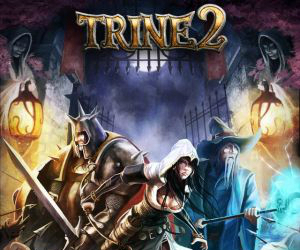 Trine 2 is out now but was it all we hoped it would be? Were those screenshots and trailers just aiming to get us excited only to shoot us down when we played the final game, or was it everything we hoped for? 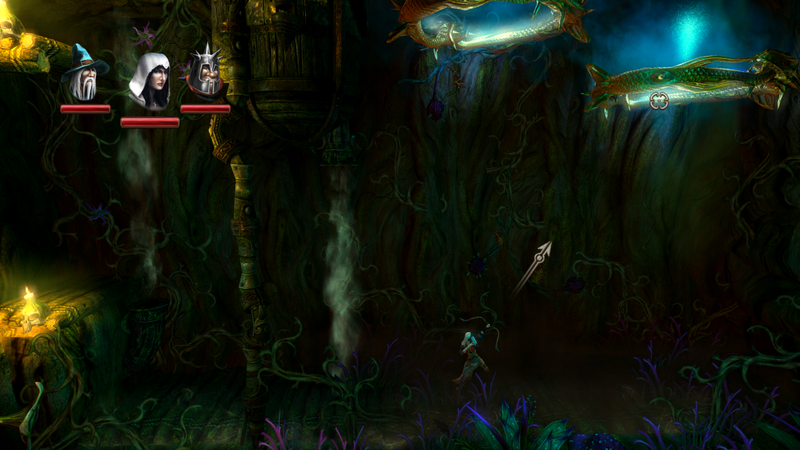 STORY: Similarly to the first game in the series, Trine 2 revolves around the Trine, a device that manages to fuse our three heroes into a singular location in space and time, allowing them to swap out which one of them has control as they please but only allowing one of them at a time to do so. At the end of Trine our three adventurers went their separate ways – their mission had been completed after all – but the Trine needs help again and there’s only a select few that it’s willing to ask. The start of the game reintroduces the player to all three of the characters, Amadeus, Pontius and Zoya, through three separate sections that have you controlling just one of them at a time. This is a nice touch as it gives the players a chance to get to grips with each character individually before the real game begins, while also making sense in terms of the story. While the story is serviceable and in some cases quite good, it never really gets to the level of some other games on the market, most players won’t find themselves caring about the three characters except for the part where they specifically need one of them to complete a puzzle; surviving a goblin attack without Pontius is almost impossible. While the main story isn’t overly exciting, the collectible poems that are dotted around each level are particularly interesting, often driving the player to find the next one in order to continue the little sub-story that is told within them. 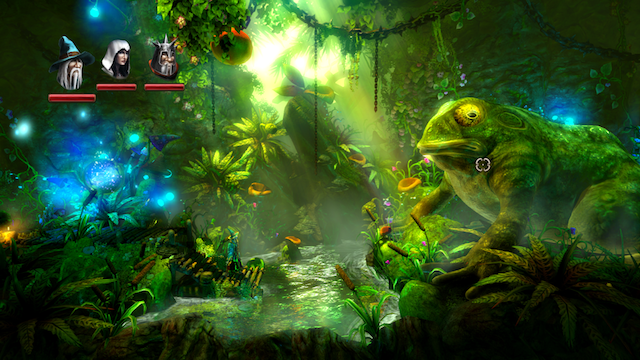 GRAPHICS: Trine 2 is, without a doubt, one of the best looking video games that’s available to be played right now. There are other games that look good in other genres, and some people may even have the opinion that those other games have better visuals, but there aren’t many games that I play that get me excited to walk into a new area just so that I’ll be able to experience a brand new visual. A lot of the areas within Trine 2 will look totally different to the area that the player was in previously, this difference keeps the player driving forward as the will inevitably be curious about what will be waiting them around the next corner. Everything from the lighting in the sky to the water that’s on the ground, and almost everything in between, looks amazing. Any screenshots you may have seen – as amazing as they look – really don’t do the game justice. The first Trine game looked good too but with this second entry into the series Frozenbyte have really pulled out all the stops and pushed their game to the very limits of its capabilities; and it paid off. SOUND: The sound design within Trine 2 is another outstanding aspect of the game, everything from the soundtrack to the voice acting is top notch, recorded well and conveys the story exactly how you’d expect it would. All of the music fits what is happening on the screen at that particular moment very well and – more than just that – it sounds amazing. The compositions are full bodied and a lot of people may find themselves listening to the soundtrack (which is included in the Collector’s Edition that everybody should be getting) when they’re out and about. The voice acting that’s included within the game is performed well and will keep players invested in the game. The only difficulty with the voice acting is getting over the logical barrier of seeing the three characters within the game talking to each other even though only one of them are on the screen at any one time. This is explained within the game but it doesn’t stop it being a little weird at times. GAMEPLAY: Just as with the first game in the series, this second foray into the beautiful world is essentially an action platforming game with a lot of puzzle elements. The vast majority of the time you spend in the game will have you navigating your surroundings, climbing obstacles and switching to Pontius in order to destroy the odd army of goblins. The gameplay elements are extremely simplistic and this might be the main attraction of the game. You don’t have to spend hours working out what the game is expecting you to do, you don’t have to read hours of quest text just to figure out what the storyline is; just jump in, pick up your controller (or keyboard and mouse if you’re playing it on the PC/Mac and that’s more your kind of thing) and enjoy the game. The puzzle elements are back from the first game too and most of them will involve using Amadeus in some form or another. Amadeus the Wizard can create strange mechanical boxes from nothing by simply drawing a box in the air. The box appears wherever the player created it and then Amadeus can use his magic in order to move it into the required position. In the early stages of the game only a single box can be created but by utilising talent points (which are awarded to the player when they collect enough experience points) they will be able to upgrade this in order to have two boxes in the world at the same time; or even create planks. The puzzles that don’t utilise one of the heroes generally stick to the tried and tested puzzle tropes of this type of game, tasking the player with moving switches, navigating mazes and other things that a lot of us will already be used to by now. There are plenty of collectibles too, for those players that like to spend as much time as they can within a game, collecting everything that the game has to offer (and who can blame them when the game in question is as gorgeous to look at as Trine 2). The collectibles mainly comprise of either concept art and poems which can both be seen at any time once they’ve been collected from the menu screen. The poems are interesting, adding a little bit of a sub-story to the events happening in the game at that moment in time. They’re short little poems, consisting of four lines each, but these are interesting enough to get the player to look for each one that’s available, just to get the next part of the story. 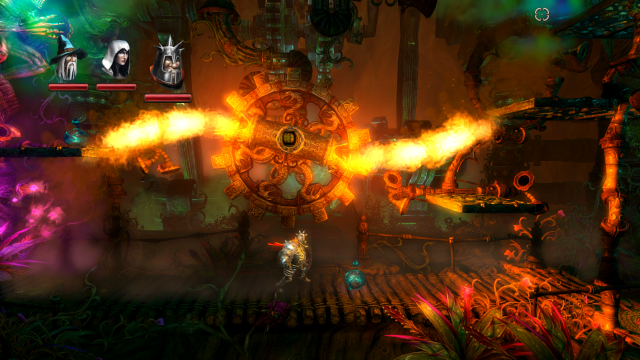 The multiplayer is one of the most impressive aspects of Trine 2, allowing players to play with up to two other people in co-op. Playing through such a beautiful game is a treat in itself but being able to experience it with up to two friends is pure joy. The really special part is that if you’re playing the game through Steam then it also works cross-platform thanks to the Steam-Play feature. You can be on a PC and your friends on Macs and you won’t have any problems whatsoever playing the game together. If only all games were like that! Playing the game in multiplayer does make some of the levels a little too easy, allowing someone to play as Amadeus the Wizard and almost literally guide the other player across hazards within the game. LONGEVITY: As with most decent games out there at the minute, the longevity of Trine 2 depends entirely on what you’re willing to put into it. If you’re only interested in the story then there’s no reason in playing it more than that initial playthrough. If the looks of the game tug at your heartstrings then you can almost guarantee that you’ll be re-entering the world of Trine 2 every so often just to see if the environments look just as good as you remember. The multiplayer aspect of the game adds an extra layer of longevity to the game too, ensuring that those of us with friends in the game will keep coming back to experience some of their favourite puzzles all over again. VERDICT: Trine 2 is a game that everyone should be playing. The gameplay is excellent, even though it can get a little frustrating at times, and the addition of a multiplayer option already makes it much more appealing than the previous game. On top of that, Trine 2 is one of the most gorgeous games on the market right now, the depth of each area of the game is truly staggering and blew my mind every time I came up to a new section of the game. If Frozenbyte just sold screenshots of Trine 2 as art prints I’d probably buy quite a few. At the time of writing this, the Collector’s Edition of Trine 2 is about £13 on Amazon, that’s Trine 2, Trine, the amazing soundtrack and a gorgeous little art book for less than half the price of a normal console game. Talk about value for money!